BY A RURAL SCOTTISH river on an early summer’s day in 1771, someone makes a catch: a package wrapped in cloth, and inside the cloth, a baby boy, and on his tiny sodden body “the marks of violence” that may have caused his death. It does not take long to identify a suspect, the infant’s mother, who works in a nearby household. She is brought to the local sheriff’s court, interrogated, and charged with the murder of her son. Every suspect, by definition, invites doubt. Guilty or innocent? For this woman, though, ambiguities ringed an entire existence. “Bell alias Belinda,” the indictment read, was “a black Girl or woman,” a “slave or servant.” She had gone to the river, one witness said, because “you was too hot or that you had catched cold”; because, she said herself, she sought to discard a stillborn infant; because, the accusers said, she sought to hide evidence of infanticide. If the record-makers did not know her name, age, or status well enough to register them with certainty, then how can a historian hope to know anything more, like the name of the father, or how the child had died (“by strangling ... or knocking ... on the head”), or any of the reasons why? All that the documents conveyed was that Bell or Belinda worked for John Johnstone, a retired East India Company bureaucrat, and that she had come with him some years earlier “from Bengal in the East Indies” to his lowlands estate. Bell or Belinda sends a shiver of questions down the spine of this book. For to wonder about her story—about how this young woman from eastern India found herself in a Fife courthouse—is first to ask, in Emma Rothschild’s elegantly crafted narrative, how people, things, and ideas concerned with the expanding British Empire found their way to Britain. The Inner Life of Empires searches for answers through the wonderfully well-documented family of John Johnstone, Bell or Belinda’s owner, and his ten siblings. These four sisters and seven brothers grew up in “a coarse moorish” part of the Scottish-English borders in the 1720s and 1730s, where Daniel Defoe judged “nothing but what was desolate and dismal could be expected.” Yet by the time the last of the Johnstone siblings died in 1813, their world had been transformed by economic and political revolutions, by new ideas about freedom, rights, sentiments, and the self, by the expansion of empires and invention of republics. They had witnessed nothing less than the birth of the modern world. The Johnstones played only small parts in these great changes (and Bell or Belinda a yet smaller one). So why do they merit a book? They earn it less for what they did than for what they had to say about it. They reflected—and reflected on—the changing contours of the economy, politics, world affairs, and personal relations in a family archive of amazing extent, containing legal documents, financial papers and petitions galore, “diaries about carrots, inventories, complaints about torture to the Privy Council, evidence in favor of Armenian plaintiffs, letters about bundles of muslin, lists of the names of their slaves, decrees of alimony ... marriage settlements, mausolea, lawyers’ invoices, love letters from their lawyers.” Rothschild’s first achievement has been to discover and to reassemble the Johnstones’ stories from these thousands of small accidents of creation and survival. The Inner Life of Empires, with some 150 pages of notes to accompany 300 pages of text, is a tour-de-force of archival sleuthing. It is also a triumph of historical ventriloquism. Speaking through the Johnstones, Rothschild delivers a wise, original reflection on the shifting boundaries between home and abroad, private and public, at the dawn of the modern age. AS ONE WOULD EXPECT of such a big family, they often divided over matters of politics, religion, and taste. One sister, Margaret Johnstone Ogilvy, was an ardent Jacobite, who traversed Scotland with Bonnie Prince Charlie in 1745–1746, while two of her brothers fought on the other side as British government soldiers. (She was jailed in Edinburgh Castle but escaped in disguise “with the help of one of her sisters, one of her brothers, and an elaborate conspiracy involving a tea kettle and ‘a little girl,’ to convince the guards that she was ill in bed.”) William Johnstone (later Pulteney) prominently supported the slave trade as a member of parliament, while two of his brothers, James and John, advocated abolition. Several Johnstones vocally opposed Britain’s war with the thirteen colonies, while their brother Gideon fought the American patriots from a Royal Navy warship off Plymouth and New York. The one thing they shared was itself a source of division, namely a tendency to geographic dispersal. The first way in which their history counterposed outer and inner worlds concerned their engagement with imperial arenas outside Britain. 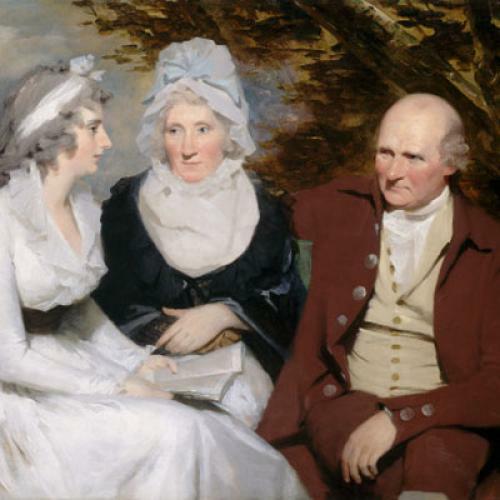 For ambitious upwardly-mobile Britons in the middle of the eighteenth century, “there were three main opportunities for advancement”: by military service, by overseas commerce, and by marriage—and all three connected the Johnstones to other continents. George Johnstone entered the Navy at thirteen, fought from the Cape of Good Hope to Cape Verde Islands, served as the first governor of British West Florida, and retired at the rank of commodore. Alexander Johnstone traveled to Grenada as an army officer, and ended up settling there on a sizeable plantation that he named Westerhall, for the family home in Scotland. John Johnstone, the owner of Bell or Belinda, joined the East India Company at sixteen, and spent the next fifteen years becoming a senior administrator in Bengal. William, the richest and most prominent family member, remained in Britain for his whole career, but amassed a personal fortune in land across several Caribbean islands, Florida, and New York. The Johnstone sisters, too, engaged in expanding arenas through their interests, investments, and marriages. One of the many subtle virtues of Rothschild’s book is its implicit demonstration that the histories of enlightenment, industrialization, and imperialism pertained as directly, and in congruent ways, to women as to men. Barbara Johnstone Kinnaird, the eldest sister, monitored family members’ prospects “in ‘the East or West Indies,’” and lived just long enough to see her daughter marry an American medical student. Betty Johnstone, the only unmarried Johnstone sister, acted as a clearing-house for family information and an intermediary in transcontinental financial transactions. Margaret, the Jacobite, became an exile in France, where she gave birth to a daughter, also called Margaret. The younger Margaret married a Jacobite exile from Jamaica, John Wedderburn, and settled in Scotland—which was to her a foreign country. Her Johnstone uncles helped her become a naturalized British subject. SO HOW DID the British Empire look to the Johnstones? Uncertain, most of all. They were “self-conscious, in an ironical sort of way, about the experience of living in the founding moment of a new epoch.” They frequently ended up on the wrong side of events. Many of the Johnstone brothers opposed the expansion of British power in India under Robert Clive, and opposed going to war against the American colonists. Several imagined that the future of the British Empire must lie in Central and South America, and promoted imperial designs that have since been swept under history’s rug, like opening access to the Pacific “by way of the Lake of Nicaragua,” or by seizing Cartagena, or by controlling the River Plate. The Johnstones envisaged an empire of what-ifs that weren’t. They also experienced an empire of centers to which they remained peripheral. As if stamped by their borderlands birthplace, the Johnstones frequently settled on the edges of greater things, making a go of it on tiny Grenada rather than on prize islands such as Jamaica; plugging away in provincial Indian outposts such as Dhaka and Burdwan before achieving significance in Calcutta; administering the wild frontier colony of West Florida, not Virginia or New York. All this roving exhausted them, when it didn’t kill them first. (Patrick, the second youngest, died at eighteen in Calcutta, and Margaret, of consumption, in Paris at thirty-two.) The Johnstones’ uncle Walter “wearied of wandering to & fro upon the face of the Earth,” while John longed to be able “to fix my wandering feet on some speck of Earth I could call my own”—and became the only Johnstone to settle permanently in the land of his birth. Yet it was here, in the heart of Scotland, that empire may have wrought the most unexpected changes on the Johnstones. Though they traversed a wide world, in which distances translated into lengths and dangers we can scarcely appreciate now, theirs was also an incredibly small one, of “minuscule political institutions,” interconnected professionals and intermarried families. If six degrees of separation divide individuals in American society today, the Johnstones’ milieu involved perhaps two. Their family exchanges offer, as Rothschild describes it, “the vista of a multiplier effect by which distant events were of consequence in the interior of Scotland.” Textiles from abroad ushered in “a transformation in the color and texture of daily life—of a spade-colored or shoe-colored world that was suddenly bright” with the indigo, yellow, and scarlet dyes of distant continents. Cloth even provoked the family’s worst feud, when John sent a bundle of Indian muslins as a gift to his mother and sisters, with tragically imprecise instructions as to how the pieces should be parcelled out. Foreign individuals, too, entered the Johnstones’ households as slaves and servants: Bell or Belinda, from India; and Africans including a man called Joseph Knight, brought by John Wedderburn from Jamaica. And each domestic intervention of empire rippled outward, into the rest of the household, and the people who came into contact with the household, so that “masons and pigeon-sellers in Stirling had ideas about the Indies” in the same vague but memorable way that, as a child in upstate New York, I had ideas about Laos and Ethiopia, and difference and distance, because of the refugee kids in my school. THE INNER LIFE OF EMPIRES draws its title in part from this geographical understanding of exteriors and interiors, the relationship between the British Empire and British Isles. It responds eloquently to an objective espoused some fifteen years ago by the “new” imperial historians, to interleave the imperial and domestic histories of Britain. But the fertility of the Johnstones’ correspondence allows Rothschild, a distinguished historian of ideas, to carry this consideration of insides and outsides into more original, if more elusive, domains. For the Johnstones navigated another boundary between outside and inside, between an exterior world of incident and action and an inner, subjective self of feelings and perceptions. These frontiers were also advancing in their lifetimes, thanks to the searching intellectual inquiries that we file under the heading of the Enlightenment. New ideas about economics translated into agricultural practices that changed the drab Scottish landscape of the Johnstones’ childhood as vividly as the infusion of Indian colored silk did their wardrobes. New concepts of rights gave rise to laws that redefined their personal relationships. New considerations of sentiment provoked questioning about the nature and the limits of the self. A restless lot “in space and time,” the Johnstones shared a “restlessness of the mind, or the spirit.” They sparkled with curiosity, and with schemes for “improvement.” William studied and “lived ‘intimately [for] four years’” with Adam Smith. Betty investigated mineral science and hoped to find coal, the eighteenth century’s black gold, on family land. James set up a lending library for the benefit of the workers at his antimony mine. Their mental universe, no less than their material one, offered novelty, excitement, and challenges. If the Johnstones knew well “the anxieties of empire,” the insecurity of regimes and fortune, so “the distinctions that were most self-evident a generation later—between law and political power, or private and public life, or the economic and the political” remained to them “the subject of endless, anxious inquiry.” How could freedom and slavery coexist? Could one distinguish an economic realm as distinct from the state? Where did an individual’s mind or spirit end and a public career begin? Given how often Americans turn to the late eighteenth century for scripts on how to live today, it is critical to remember the great differences between the Johnstones’ mental universe and ours. Many of the concepts and the boundaries that organize modern lives did not yet exist for them; while some of the divisions they were raised to believe in, notably that between slavery and freedom, have become practically inconceivable now. And yet the Johnstones’ struggle to locate themselves in an evolving landscape of places and ideas also movingly resembles turn-of-the-millennium concerns. Rothschild beautifully plays the angles of difference and similarity. She has a keen eye for the oddities that might have appeared normal, such as pregnancies feigned with the aid of pillows stuffed up skirts, and a wonderful ear for period locutions that sound fresh today. (“Our friend, Johnstone,” said David Hume, “has wrote the most-superexcellent-est Paper in the World.”) Swap out the East India Company for Goldman Sachs, Grenada for the Gulf, and the administrative bodies of the Johnstones’ day for their wider range of present equivalents, and the family’s career profiles would not sound out of place in an Ivy League alumni bulletin now. They delighted in the opportunities of global expansion and innovation, just as they worried over enduring human challenges of health, wealth, and death, mortgage payments and bad marriages and unruly children. Rothschild tells the Johnstones’ story in a distinctive voice: elegant, enchanting, alert to idiosyncrasy (how many other books index the phrase “oysters, pickled”? ), and almost obsessively precise. She rarely lets a statement stand without modifying it, glossing terms “in the sense” meant by contemporaries, qualifying examples, layering quotes, and expanding the narrative in endnotes that constitute a book in themselves. At times, though, Rothschild leaves the reader wondering just what this “series of scenes or episodes in an unsettled world” amounts to as a whole. The relationship between imperial and intellectual histories remains especially murky. “‘All history is the history of thought,’” Rothschild quotes from R.G. Collingwood’s The Idea of History, continuing: “Or some history, at least, is the history of thought: the history of empires in particular.” Why is the history of empires a history of thought “in particular,” any more than it is a history of power, or faith, or money? Why is a history of thought any more concerned with empires “in particular” than it is with emotions, principles, or values? THIS SOMETIMES peculiar blend of rhetorical specificity with conceptual obscurity plays out an essential preoccupation of this remarkable book. At base, The Inner Life of Empires ponders what must be, for the historian, the hardest to chart frontier of all: the line between the known and the unknown, the recorded and the evaded, the found and the lost. Anyone who wants to understand “how it really was in the past” faces a dilemma—Rothschild goes so far as to call it a “moral dilemma”—in trying to write a history when there is “very little evidence about the ideas of the vast majority” of people who filled it. And so back to the ambiguities: back to Bell or Belinda. The Johnstones never once referred to this woman in their letters, but she moves to the center of this book, because she personifies the vexed relationship between the known and the unknown or unknowable. Rothschild has traced Bell or Belinda’s fate from the Fife sheriff’s court as far as the documents lead: to an appeal in Perth, to a sentence of transportation, and to a ship from Glasgow to the Upper James River in Virginia. Rothschild has discovered the receipt documenting Bell or Belinda’s arrival in America, and then she—that is, her documentary trace—vanishes. “The limits,” Rothschild observes, “have their own story.” Her exhaustive archival search has made her unusually attuned to the ambiguities of records, to their deliberate manipulations, and their unintended confusions (“there were 20,426 people called Johnstone or Johnston whose baptisms were entered in the old parish registers in Scotland” in this period). Where Bell or Belinda does appear, the words are often not her own. Where she might appear, in registers of North American slave sales, the documents can no longer be found. Where her inner self, her thoughts and feelings, might have resided, there was never a transcript. And yet of all the people in this book, Bell or Belinda may have the greatest claim to being “an important and even a world-historical figure.” Another Johnstone connection casts her story into tragic relief. In July 1772, Joseph Knight, the slave brought to Scotland by John Wedderburn, read a newspaper article about a recent decision in London, the Somerset case, which had the effect of ending slavery in England. Thinking “that he also was intitled to be free,” Knight successfully sued for freedom in a Perth court, establishing a similar precedent for Scotland. But Bell or Belinda fell on just the wrong side of these landmark judgments. Sentenced weeks earlier to be “sold as a Slave for Life,” she earned the dubious distinction of being the last person in Britain whose status as a slave was upheld by the law. In Rothschild’s hands, the many “or”s of Bell or Belinda’s life become “and”s. She stands for the elusiveness of historical knowledge and the material reality of record-keeping. She represents the marginalia of history and she signifies as an “exceptional” figure in relation to the law. The Inner Life of Empires also stands on the cusp of another critical “and”: for all its “old-fashioned” archival diligence—the patient unfurling of parchments, unspooling of microfilms, opening of red leather volumes that streak the hands that touch them—this history could not have been pieced together without digitization and the Internet, which can reveal sources around the globe with a few flicks of the keyboard. It invites a digital rendering, too. I strained to see these pages enriched with graphics illustrating webs of interpersonal connections, animated maps tracing individuals’ movements, and hyperlinks to notes and sources. Whatever the consequences of e-books for the future of publishers, bookstores, and writers, The Inner Life of Empires gestures toward the enormous intellectual potential of history e-books as written and multi-media forms. Where documents end, the imagination continues. Was Bell or Belinda thinking of Bengal that summer day in 1771? In that water-latticed land, people usually went to riverbanks to bathe or to worship; and sometimes to discard the dead. She may have been enacting what she could so distantly have seen, as she launched her child’s body, wrapped in cloth, into the meandering stream. Maya Jasanoff is professor of history at Harvard and the author, most recently, of Liberty’s Exiles: American Loyalists in the Revolutionary World (Knopf). This article appeared in the June 28, 2012 issue of the magazine.